Following the 80th meeting of the IUPAC Bureau in Bled, Slovenia, the name roentgenium for the element of atomic number 111, with symbol Rg, was officially approved on 1 November 2004. The IUPAC Council, at its meeting at Ottawa, Canada in 2003, delegated the authority to approve a name for the element of atomic number 111 to the Bureau. In 2003, a joint IUPAC-IUPAP Working Party (JWP) confirmed the discovery of element number 111 by the collaboration of Hofmann et al. from the Gesellschaft für Schwerionenforschung mbH (GSI) in Darmstadt, Germany (Pure Appl. Chem. 75, 1601–1611 (2003)). The most relevant experiment resulted from fusion-evaporation using a 64Ni beam on a 209Bi target, which produced a total of six decay chains of alpha-emitting nuclides following the presumed formation of 272Rg + n (S. Hofmann et al., Z. Phys. A 350, 281–282 (1995); S. Hofmann et al., Eur. Phys. J. A 14, 147–157 (2002)). In accordance with IUPAC procedures, the discoverers proposed a name and symbol for the element. The proposed name was roentgenium, with symbol Rg. The Inorganic Chemistry Division Committee then recommended this proposal for acceptance. The provisional recommendation has now successfully passed expert examination and the prescribed period of public scrutiny. This proposal lies within the long-established tradition of naming elements to honor famous scientists. On 8 November 1895, Wilhelm Conrad Roentgen discovered X-rays, a new type of rays to which he gave this name in view of their uncertain nature. Their use has subsequently revolutionized medicine, found wide application in technology, and heralded the age of modern physics, which is based on atomic and nuclear properties. 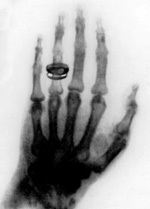 In 1901, six years after their discovery, the benefit of X-rays to humankind was so evident that Roentgen was awarded the first Nobel Prize in Physics. Element 111 was synthesized exactly 100 years after Roentgen’s discovery. 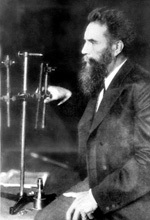 To honor Wilhelm Conrad Roentgen, the name, roentgenium, was proposed for the element with atomic number 111.